Investing in Art Nouveau Jewelry made from gold, silver and non-precious materials can be highly profitable for the Art Nouveau investor. This style of Period Jewelry is always in vogue. Since its introduction in the Fin-De-Siecle, (end of the century) the desirability of Art Nouveau (New Art) forerunner to the Edwardian Style has just kept growing. Art Nouveau facts state, that the word, 'Art Nouveau' was named after an avant-garde Paris shop, 'La Maison de l'Art Nouveau' in 1900, and was known by that name in France, Belgium, Holland, England, and the United States. In other places around the world, 'Art Nouveau' was called by other names, "Jugendstil" in Austria and Germany (after the magazine Der Jugend, "youth") and "Modernismo" in Spain and "Floreale" or "Liberty" in Italy. Proponents of the Art Nouveau movement tried to synthesise all the arts together, in an attempt to create an art based on natural forms, that could be mass-produced for a large audience. Art Nouveau design influenced ALL the decorative arts. The free, sinuous whip-lash curve of Japanese print designs inspired Art Nouveau artists who also borrowed from the expressive patterned style of famous people in history such as Vincent van Gogh and Paul Gauguin. The Art Nouveau movement has left us a legacy of outstanding jewellery of an understated debauched delicacy. Indulgent sensuality was a dominant force and designs of nature were endowed with the female form, rippling hair, writhing abstract forms, wriggling marine plants resembling tentacles. 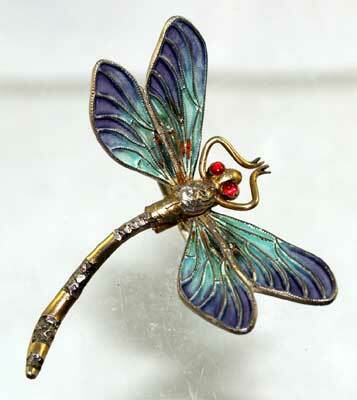 The meaning of flowers in jewelry was fully exploited in the jewelry of this period. There was a wildness of nature uncontrolled by man, like the fine-de-siecle culture that was characteristically unrestrained and freewheeling. In Britain, the only jewelry remotely resembling Art Nouveau style was the jewellery made by the Ancient Celtic people. Color is the child of nature, and when you invest in Art Nouveau enamel Jewelry you will notice the beautiful colors that closely resemble the natural world. The use of enamels to achieve certain shades, textures and colors is a quintessential key element that features strongly in the period. Lalique's acute awareness of color and texture coupled with his feeling for the spirit of the subject beyond its physical reality, was unequalled. René Lalique's work epitomized the view that value lay in the designer's vision and the craftsman's skill rather than in the size of the gemstones. Many of Lalique's masterworks were in fact, crafted from non-precious materials such a horn and glass. Actress Sarah Bernhardt brought Lalique great fame by promoting his designs, which she boldly wore on-stage and at public events. How to invest in Art Nouveau jewelry is do-able, even for those new to collecting Antique Jewelry, providing you do a little homework first. When you invest in Gold and diamond Antique Jewelry or antique costume jewelry and natural pearls it is advisable to familiarize with the Antique Jewelry buying basics first. Moonstone along with chalcedony, horn and glass were popular materials used in Jewelry making during the Art Nouveau period. Non-precious gemstones and materials were chosen for desirability as a motif and not for their expensiveness. Coco Chanel with her trademark, rope of Simulated Pearls is a fine example of the use of non-precious materials employed in Jewelry design. Pearsall, R., 1999, A Connoisseur's Guide to Antique Jewellery, Todtri Publishers, New York.